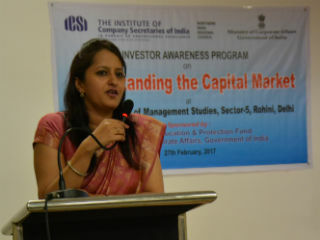 “E-360: The Club Economics” of JIMS, Rohini organized a session on "Investor Awareness Program" on the topic, "Understanding the Capital Market" in association with the Institute of Company Secretaries of India (ICSI) on 27th Feb 2017. The students of 2nd and 3rd year of BBA attended the session. The guest speaker of the session was CS. 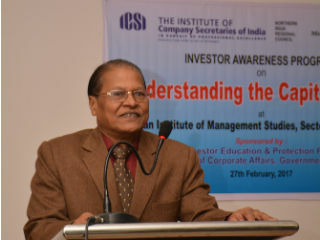 Dr. J. K Bareja, Associate Professor in Delhi University who has been associated with ICSI for the last 25 years. 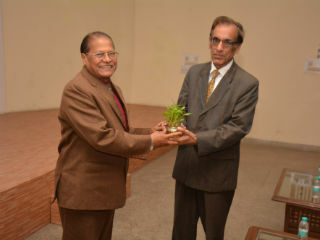 The session started with the felicitation to our honorable guest speaker by our esteemed Director, Dr. J. K Goyal, with a sapling as a token of gratitude which also signifies his vision of clean and green environment. He then gave the students a brief about the session and also told the important information relevant to the theme. The session was then carried forward by Dr. J. K Bareja, as he went on to tell the audience about savings, problems related to it and how to save prudently. Further, he discussed about Financial Assets which covered various topics such as life insurance policies, public provident fund, fixed deposit, debit funds, equity funds and stocks. He also shared with the students about the return percentages of the same. In this 2-hour long interactive session, students asked many questions on shares, stocks etc. Many topics like primary market and secondary market, DEMAT accounts, depositories and other related aspects of capital market were also taken into account. As the session kept on progressing on an interactive note, the students were highly enthusiastic as the speaker concluded the session with his words of wisdom. 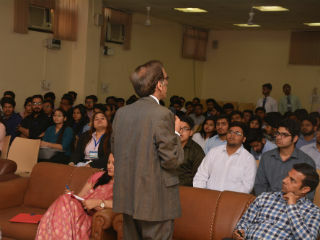 Later the session was also summed up with a vote of thanks by the club’s faculty coordinator, Ms. Mansi Arora Madan, who took the opportunity to extend her warm gratitude to the guest speaker, the management of the college, the students who actively took part in the event and also the coordinators who worked hard to make this event a huge success. Later, the students were provided with refreshments and certificates from ICSI. All in all, the session was a smooth conduct replete with knowledge and healthy interaction.